People are selling their phones with Flappy Bird pre-installed for insane prices on eBay, while creator Dong Nguyen gets bombarded with death threats online for pulling the game. Staying true to his word, Flappy Bird creator Dong Nguyen has pulled the hit game from Apple's iOS App Store and Android's Play Store. 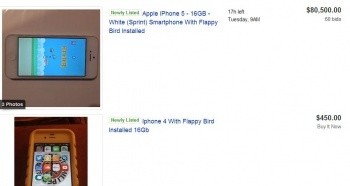 Seeing as the side-scrolling puzzle title is very popular these days, capitalizing entrepreneurs are now selling their devices with Flappy Bird installed at insane prices online. At the time of this writing, the cheapest eBay listing has a 16GB iPhone 4 with Flappy Bird installed going for $450; while at the other end of the spectrum, a 16GB iPhone 5 with the game installed is now going for a whopping $80,500 and has 60 bids to date. For reference, a brand new iPhone 5 in the US sells for $750, though it doesn't have Flappy Bird installed, of course. So, if you want in on the latest craze with the mainsteam gamers, you might need to shell out a tiny bit of cash. But what's money when you're sharing your latest score with your friends, right? In other Flappy Bird news, creator Dong Nguyen has received a ton of death threats online for pulling his game. Not only death threats mind you, but people saying they'll kill themselves if he proceeds with his plan -- which he already did. You can read the absurd exchanges here. Word of warning, though, it might make you cringe a little at just how much these people like having a little bird fly over pipes. Update: According to one Twitter user who claims to have received an official e-mail from eBay, the Flappy Bird goldmine may be about to run dry. 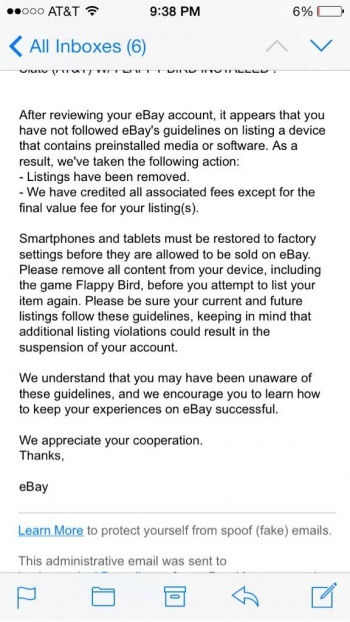 The email specifically states that all iPhones sold on eBay must be reset to factory settings, and even specifically mentions that all content must be removed from the device, including "Flappy Bird".